Congratulations to Sherry S. whose tweet comment won the drawing via Random Number generator! Here’s the prize pack in our Spa for Ma 2011 giveaway! 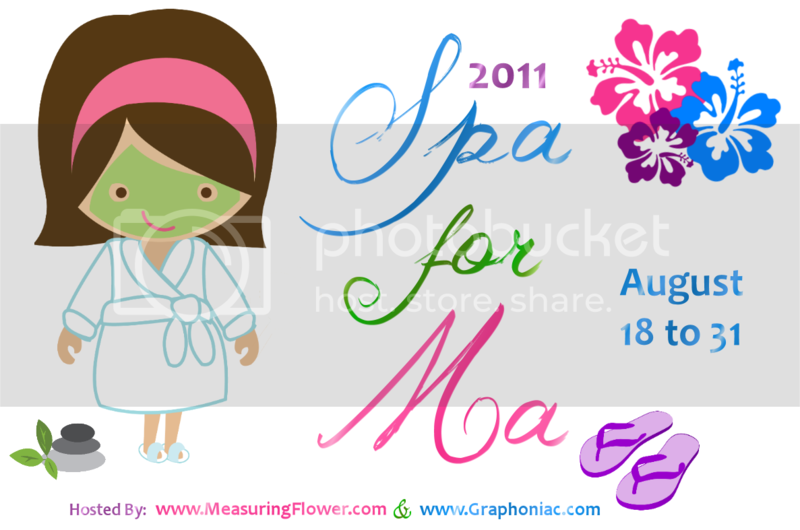 Spa for Ma 2011 is a collection of blogs that have been chosen to participate and give away prize packs worth at least $100! Our prize is a gift pack with an estimated value of $107! The pack includes a BC Spa Sculpt Set, a Cheetah Spa Set, a Travel Bag and a gift certificate for $10 off! The BC Spa Sculpt Set includes BC Spa Sculpt Body Sculpting Gel and Firming Body Creme. They are created using the latest scientific advances. Each are blended with natural botanicals and essential oils to offer a holistic approach for providing unparalleled benefits. These products work in harmony to free you from the affects of time. Their unique formulation will help return your body to a healthier, more youthful appearance. So if you’re wanting to smooth out the appearance of the skin on those thighs or under your arms like I am, this is the prize pack for you! The Cheetah Set includes a exclusive headband and spa glove set that is sure to make your spa time “purrrrfect”! And the Tavel Bag will help ensure that you meet all airline regulations when bringing your spa treatments where you go! (*Silvertone platter not included). symbol at the top of the page when you get to the website. And 25% off to everyone that mentions “Spa for ma 2011” when ordering! This code is not available for website orders, please contact by email (bcspa@pmicreations.com), or phone (972-342-7559) to use this code. Check us out on Facebook: http://www.facebook.com/pmicreations or Twitter: http://www.twitter.com/pmicreations for updates on this fantastic event! Great big THANK YOU to our hosts for this event: Measuring Flower and Graphoniac. One winner will receive a prize pack valued at $107. Prize pack only available to U.S. and Canadian Residents. Leave a comment letting me know why you’d like to try the BC Spa Sculpt set and make sure to include your correct email address so we can contact you if you win. Email subscribe to the newsletter. Make sure you leave a comment for each item you performed for extra entries. Contest will end on Wednesday, August 31, 2011, at 11:59 PM EST. Winner will be chosen by online random generator. Winner will be notified by email, so make sure your correct email address is in your comment. Hop to the other bloggers giveaways too! There’s lots of cool stuff their giving away! Okay, I know comment #1 rarely wins, but I have faith!!! 🙂 I would LOVE it, because I’ve been so stressed out and I need to relax. This would rock! I am under a lot of stress so anything to relax would be amazing. I would love to win because I would love the Body Gel and Body Firming Creme. I also could definitey use a travel bag. I’d love to try the BC Spa Sculpt set because I’ve lost some weight and really need to pamper myself…and this would be perfect for me! Now that I have surpassed the 40 year mark, I am finding that things are changing in my body. My skin is not as taunt as it used to be and wrinkles are starting to show themselves. It would be great to try the BC Spa Sculpt set. Perhaps it can put my body back where it is supposed to be! I am subscribed to your Newsletter using dod@rogers.com. I would love to try the BC Spa Sculpt set because I’m fast approaching 40 and could use a little help in the firming department! I would love to be able to be pampered and use this. After having a baby, I can use any help firming I can get. I so need to be pampered~Thanks for the chance to win! I would like to try it because I need some firming. i would love to win and firm up my skin! I’m on Weight Watchers and I’ll need all the help for loose skin I can get! Body sculpting gel? Oh heck yeah, bring it on! i just had a baby, i have some floppy skin in my midsection! I’m so stressed out because of work and family and I need to be pampered. I would love – like to try the BC Spa Sculpt set so I can take some me time to relax. It has been very busy around here and I need to just chill. Here it goes. I have faith that I will win this one. I never wind anything so I have a good feeling about this one….I could really use this…. after three kids I could use this! I’d like to win b/c my tummy is a lot more flabby than it used to be since I had a baby. I’d love a little help toning it back up! I am a confirmed email subscriber to your blog..
I’d like to try the BC Spa Sculpt set simply for the lure of looking younger! I like PMICreations Mobile Spa and Gifts on facebook as Wendy R.
Following @pmicreations on twitter as @ArtsyChaos. I’d like to try it because I’ve never heard of it! I’ve never tried a firming lotion like this but it sounds wonderful; thanks for the chance! I would love to win because my skin can use a little firming, especially my arms. I’d like to win because my body needs some pampering. some firming could be needed lol!! I would love to try this because after having 3 babies I definitely need some sculpting and tlc! I would like to try this because I have never been to a spa and these past few months while I have been unemployed have been really stressful and I could really use a spa treatment. Email subscriber to this blog.